BMW K1600 Forum : BMW K1600 GT and GTL Forums > General BMW K1600 Discussions > BMW K1600 Accessories > How to Secure Backpack to a BMW When Off It...Silly idea? How to Secure Backpack to a BMW When Off It...Silly idea? Ladies and Gentlemen; My wife and I are going to tour Italy for the month of September. 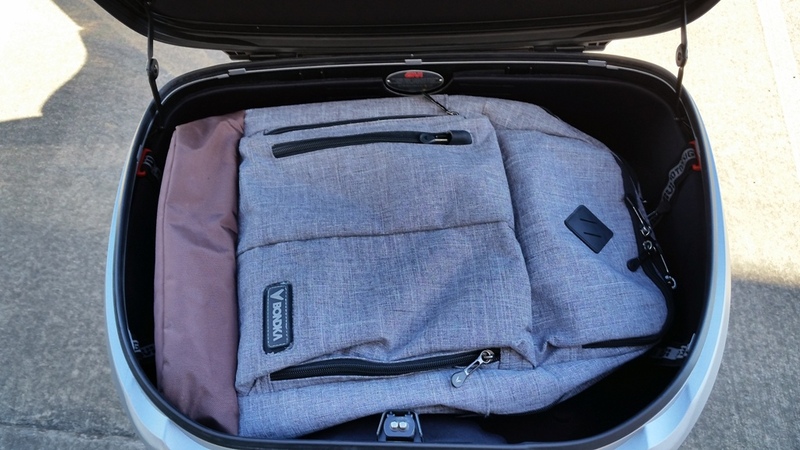 Yes, my wife, and that puts a premium on stowage I thought a backpack might be handy to carry some bulky items such as a pair of off-bike shoes or gear I might need to get to quickly...or a blow dryer ( ). So does anyone have any clever ideas about how to secure a backpack onto a bike like an RT or a K16? You know, so you can walk away from the bike (like for a coffee or a nature call) and have a reasonable expectation that the pack would still be there when you returned, or is that whole notion a completely ridiculous one? I haven't bought the pack yet so all options are open. I know "secure" may be a relative term but any ideas about means and methods that might "up" the chances of the pack still being on the bike would be appreciated. Meese and dobervol like this. Thanks for this. I didn’t know about them, and had just used rok-straps or Wunderlich. I have also tried to use a cable lock run through, around, over and under enough that a thief would likely either destroy what they’re looking to steal in the process, and/or call attention to themselves. These straps are kind of the same idea, but let you save the cable lock for moto clothes, if necessary. Don't go cheap when you want security. A thief will cut open the backpack in the blink of an eye, they will even do it when you are walking down the street with the backpack on. I travel all over western and eastern Europe and use the Pacsafe net system. Thieves see it and look for easier takings, it's worth the cost. You have a top case, no? Or is it going to be full of other stuff? Thank you for all the input, gentlemen -- very helpful. K16 Forum is almost always the best resource out there. The net is a great concept but consumes considerable volume to stow. I like the Lock Strap for compactness. However, it will require some thought about the pack itself in order to prevent a loop on the pack from simply being sliced and removed leaving the Lock Strap as the only thing securely fastened to the bike. Among my wife, Vivian's many skill sets is "seamstress" and she has some good ideas about how to modify a pack to utilize the strap. Of course, as always, the best method is to pack less or launder more and don't bring anything you can't replace if necessary.